Were 440s that went into imperials assembled any different than 440s that went into cheaper cars like furys or trucks? What compression ration and heads should I expect from this motor? Production line engines were not built for a specific car, they were built to a spec and shipped from engine plant to assembly plant where they are pulled from stock as needed. With a 10" Street Fighter converter and 4.56 gears, the '64 ran 12.80's. With a fresh valve job and a factory Max Wedge intake/600 Carters, it ran 12.40's @ 108mph every time we raced it. The thing would never skip a beat and it ran fine when it was pulled in 2001 for the 'good' motor. It was plenty streetable, but highway drives were a little short with the 4.56s. The 285/70 BFGs calmed that down a bit at least. We joked that it did not have enough power to blow itself up. NICE, nice and simple. I had a block once that was so worn out and I had to finish the season with it. I dingle honed the block and put double cast rings in it. (cast top and 2nd). That sucker ran like you wouldn't believe and sealed up great. Grab the 400 dollar deal offered. Does a cast crank motor have counter weights on both the damper and flexplate? Or is there also a weight on the torque converter? How am I going to use my PTC converter with an external balance engine? B&M makes a line of flexplates that are designed for that. 1998 Ram 2500 QuadCab, new daily driver. Yep, they sell balanced flex plates. Alternatively you can weld weights onto the converter ring gear. Do not use a 509 cam in a low comp engine you will make the car a pig I would concentrate as stated on heads and engine dist running all the total I could get the car to run/ start with in normal fashion Run a hyd cam of around 480-490 lift keep the centerline at around 112 Good intake and exhaust If you can try a 350 horse from late 60 early 70s still around and cheap if still in a car. Do not pay any attention to the Mopar bible for total timing limits of 36 or so Give the engine all it can take and back off when she barks. Run a 650-750 dbl pumper 650 for throttle response 750 if you can for overall power and drag racing. Have fun and just do it ! You dont think 509 cam even with 4.10 gears and 3000 stall? I went out to the guys property today, and the 73 is complete as advertised and turns over. I didnt buy it yet because there is a 71 still in a car that hes trying to sell today, and if he doesnt sell it, I can take the engine for same price. If you have the 509 that's one thing. 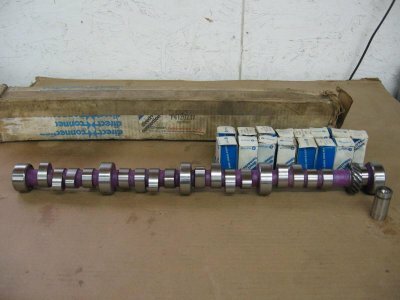 If you have to buy, then get the 108LSA 484 if you want to run a mopar hydraulic cam. The 509 might make more power in the last 500 rpm and it's not going to be by much. The 484 will pull the midrange better. Especially if you advance it a bunch as mentioned earlier. I'd run a Lunati Voodoo 60303 or 60304 cam before the Mopar cams. Damn he sold the 71. There is one option left besides the 73. A 67 440 that needs a rebuild. He'll sell the complete motor for 650 ( I believe it has the 915 heads with small exhaust ports) or the short block plus all the pulleys, water pump, brackets for 350. Has a bit of surface rust in some of the cylinders from having one of the heads removed a long time ago (covered in garage) so it may need a bore job. If it needs to be bored then Id have to get new pistons and then my cost is going up at least $300 to $400 just in pistons.